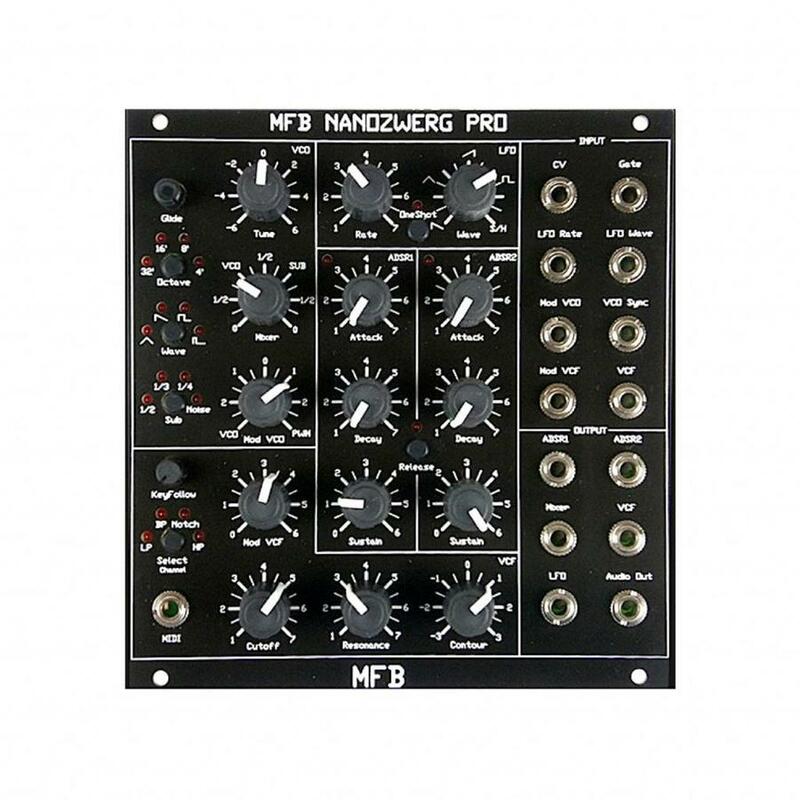 The Nanozwerg Pro Module is complete monophonic analogue synthesizer unit within a very compact size. 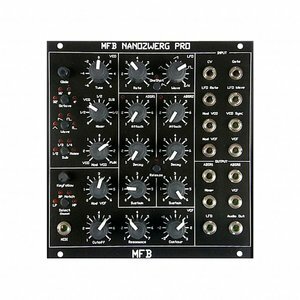 The Nanozwerg Pro Module is complete monophonic analogue synthesizer unit within a very compact size. With its VCO, Suboscillator and 12 dB Multimodefilter the synth voice is able to create various sounds from bass- and sequence- to electro-, effect- and drone styles. Furthermore you can add white noise and external signals to create more complex sounds or just for use as filterbox. The VCO creates the waveforms Triangle, Sawtooth, Square and Pulse. The foot scale (octave range) goes from 32' to 4' and the fine tuning around +/-6 semitones. For fatten the sound a Suboscillator can be switched to three different intervalls or White Noise alternatively. A Mixer knob blends VCO waves into Sub/White Noise. A Glide effect is provided too. The 12-dB-State-Variable-Multimodefilter owns LOWPASS, BANDPASS, HIGHPASS and NOTCH and its CUTOFF can be controlled manually, by LFO or ADSR. The RESONANCE allows selfoscillation and KEYFOLLOW spreads the filter frequency depending on the note. The LFO offers four waveforms including SAMPLE&HOLD and ONE SHOT who works as a envelope - after a gate impulse one cycle of the selected waveform is generated. An innovation is - the first three waveforms can be morphed to each other. Beside Filter CUTOFF, PITCH and PULSEWIDTH of the VCO can be adressed by the LFO. The first ADSR envelope controls the CUTOFF with negative or positive slope, the second ADSR controls the VCAs volume. Almost every parameter can be controlled via CV, the envelopes and LFO have CV outputs. An external in feed the VCF alternative with other soundsources. MIDI IN allows to control the module with your DAW or other MIDI gear. The NANOZWERG PRO recieves NOTE ON, PITCH WHEEL (+/- 1 halftone) and MIDI CC. Alternative the faster M-BUS connection offers the same features.